The Illusionistic Universe Centered on Planet Earth. 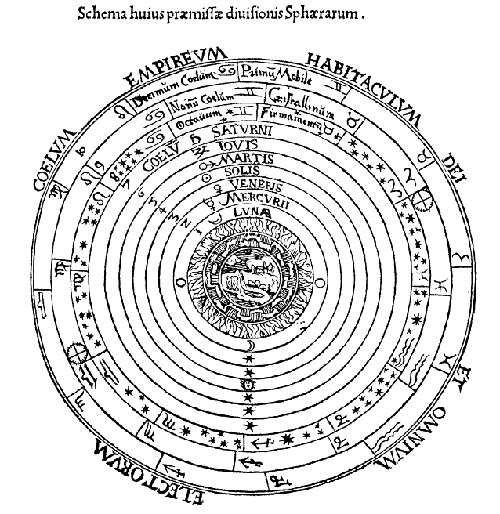 Nicolaus Copernicus Hypothesizes that the Sun Lies at the Center of the Known Universe. 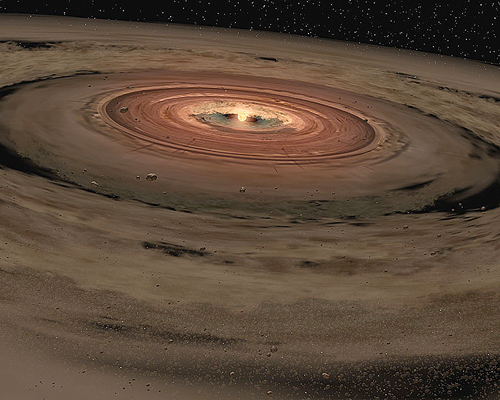 Gas, Dust, and Planets Orbit a Conceptual Star During Planetary Formation. 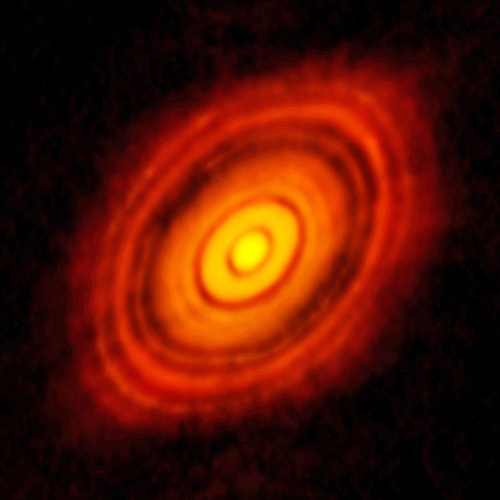 A radio-telescope image of actual planetary formation around a young star in the constellation Taurus. 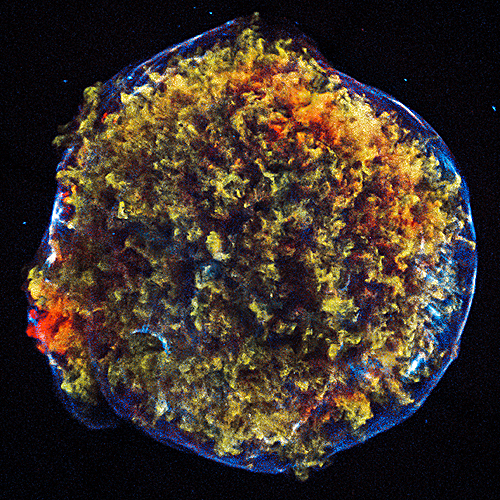 X-ray Image of Remnant of Supernova Witnessed by Tycho in 1572. 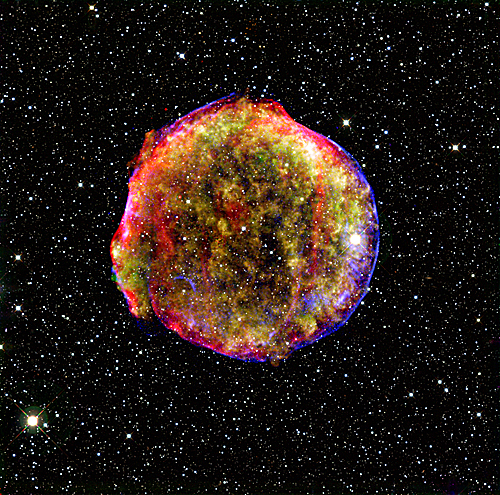 Visible-light Image of Supernova Witnessed by Tycho Brahe in 1572. 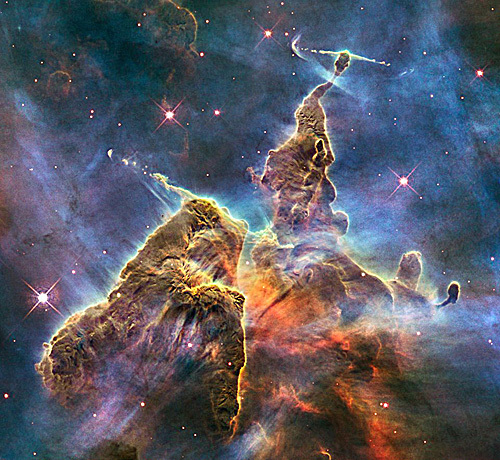 A Region in the Constellation Carina Where Clouds of Gas and Dust are Forming New Stars Under Gravitational Pressure. 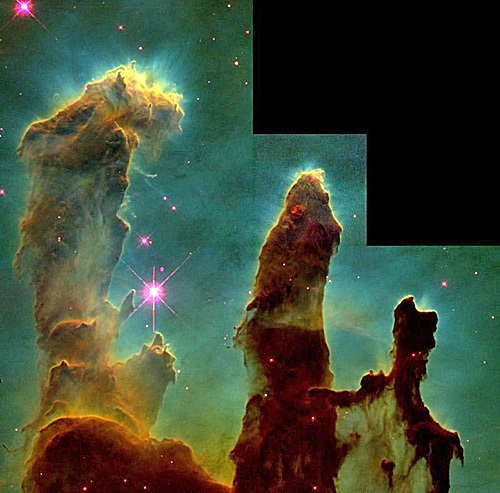 The So-called Pillars of Creation, Columns of Gas and Dust Being Compressed into New Stars. That old style universe is based on an illusion that projects both Earth’s rotation about its axis and orbit about the sun onto the stars, which are wholly innocent of forcing that illusion upon us. The illusion is our own doing, and has been for more than six thousand years. Creation is ongoing today, and is a much messier affair than Plato could suggest in his philosophy. The cosmos is not what we think it is; it is what it is in itself. Our assignment, should we accept it, is to bring ourselves into as close agreement with that fact as we are able, given our habitual frailties and fallibilities of mind. This particular post brings to an end my series of posts illustrating human engagements in the case of baseball, Roget’s Thesaurus, and the stars. My job from here on is to discuss the way-stations along my introspective journey as illustrated in these recent posts, then present a brief summary of what conclusions I have been able to draw. The stars that we are born to in the twenty-first century are not that different from the stars our ancestors have been born to for hundreds of generations. But the cultural setting within which we view those stars today is entirely new in the history of the Earth. Both our perception of the stars and the ways we think of them within our various fields of understanding—astrology, astronomy, astrophysics, theology, mysticism, art, and so on—vary from place to place, time to time, so that stars have a very human history culminating in the mind of each person living today. Consciousness is as much a matter of cumulative life experience as it is of perception and memory. Our personal experience is influenced by our natural experience, as well as our cultural, communal, and familial experience. Van Gogh’s Starry Night conveys some small part of his personal experience of the stars. NASA’s Hubble Space Telescope details other aspects of the stars that most of us have never personally experienced or imagined. Perspectives available to us today simply did not exist only a few decades ago. Yet we are the progeny of stars themselves, and cannot be anatomically, physiologically, or psychologically separated from their influence on our innermost mental and physical being. We are born of the stars as well as to them. In a very real sense, the stars ‘R us. We are star stuff up and walking around, ogling our extended family spread through the universe. That is no poetic dream. The atoms we are made of were forged in supernova explosions that cast those atoms into space, where gravity took over and condensed those same atoms into a mass so dense that they ignited to form a new stellar system, together with a retinue of planets that included what we now call Earth, our home in space for all the days of our lives. It is fitting that throughout history every tribe and people has paid homage to the stars. The Sumerians did it according to their lights in Mesopotamia, Plato did it his way in Greece, the Neoplatonists in Alexandria, and now NASA, a governmental agency, spends billions of dollars in paying homage to the stars, planets, asteroids, comets, and meteors of today. The meaning that every generation projects onto the stars is a salute to our origins as couched in the meaningful terms of the day. The stars have always had place on the leading edge of human understanding. The stars have not changed all that much, but our understanding is now undergoing an exponential growth spurt that leaves our past understanding lagging far behind. We used to put haloes around the heads of our saints to signal their divinity (connection to the stars). We built Gothic cathedrals to seat our bishops that had stained-glass windows dedicated to the zodiac, and mechanical clocks with rotating symbols of the twelve zodiacal houses, again to show honor to the stars as we interpreted them in Mediaeval times. Those cathedrals served as models of the supposed celestial hierarchy worked in stone, with their vaults shining down on the seat of the bishop below, and those assembled around him, as if that seat were the throne of reason, order, harmony, truth, and beauty on Earth. As Chartres Cathedral was abuilding in the thirteenth century, Thomas Aquinas wrote (in Latin) of the stars: “Nothing can move itself; there must be a first mover. The first mover is called God.” The prime mover that drove the universe was as alive in our formative era as it had been in the days of Pseudo-Dionysius, Ptolemy, Aristotle, Plato and, before him, the Sumerians. What all that effort achieved, rather than making a place for humanity in the stars’ cosmic scheme, was assign them their place in our psychic scheme, so having us ride our own coattails round and round, as if tied to a peg driven into the ground, setting us back for well over five thousand years in solving the world puzzle from inside our respective black boxes. But that peg in the ground has been yanked up by a succession of new thinkers: Copernicus, Tycho Brahe, Galileo, Kepler, Isaac Newton, Charles Darwin, Gregor Mendel, Einstein, and many others who have built the new cosmology of today that recognizes the stars for what they are in themselves and not merely the due we thrust upon them out of our own needs. The idea of binding our lives back to the orderly motion of the stars is one of the most profound realizations that the human mind has ever entertained. We have evolved to appreciate the patterns, brightness, and motions of the stars at night; that should suffice. We need not look for a message coming from them any more than we look to a mockingbird or giraffe for truth. If we truly honored the stars, we would celebrate their gift of light and energy, so receiving them as they give themselves to us without overlaying our psychic needs on their radiance. We don’t look for messages from baseball or Roget’s Thesaurus, yet we freely engage with them as valuable aspects of our experience. Why impose such a burden on the stars in order to fit them into our scheme of things? Instead, we should do everything we can to live in harmony with the natural world, of which stars are one of the highest and most eminent expressions. At this point I can hear my Quaker friend Ken Doyle stepping in to tell his joke about the three baseball umpires being interviewed by a reporter after the big game. How do they go about making such difficult and often controversial calls as their duties require them to? Each umpire does the job his own way in light of his personal belief, as each player plays, and each fan roots, everyone in the stadium giving as he or she is able to give, and receiving a like gift from everyone else. Like the three umpires, artists, scientists, and theologians see with different eyes. As do the young, the mature, and the elderly. The Sumerians saw the stars their way, Plato saw them his way, Pseudo-Dionysius his way. It is unrealistic to sort through them in trying to decide which is right. They are all right and all wrong in some respects. But under the circumstances, they each were true to their perceptions, judgments, actions, and life engagements—to their minds and personal experience. Our predecessors have borne witness to the stars as only they could at that time in that place. What more could we ask? It is now our turn to see them through our own eyes. That, now, is something to celebrate. As well as an obligation to right the wrongs of the past. Tomorrow: photos of the heavens from our modern point of view, so ending this review of human engagements with baseball, Roget’s Thesaurus, and most recently, the stars. It was in the minds of forgotten, long-ago thinkers that the notion of divinity was coded into a language of symbols and rituals to bring about the obedience of humanity to the will of lustrous gods in their cosmic heaven through the agency of priests in their Earthly temples. I don’t know who developed the ideas that bound the Sumerians to the orderly pageant of heaven as a kind of living mythology, but that idea was a potent one that caught priestly attention because none other than the local priest himself would play the mediating role between the so-called prime mover of the stars and those who read the radiant, angelic signs from below. Earth and its cosmos would share in the same divine (shining, godly) order if the two could somehow be linked at the nexus between them, so unifying state, church, and people under the figure of a prime mover (creator and supreme being) in his heaven. Sumerians set up the linkage, and have left shards of the cuneiform star chart or plan of heaven they worked out based on three celestial regions watched over by three separate gods. Anu as the highest god resided in the central, circumpolar region; Enlil, king of gods, resided in the zodiac made up of houses of twelve lesser gods marking out the paths of sun, moon and planets; and Enki, father of divine wisdom, resided in the fringe area closest to the pillars that held the heavens above the Earth. A trinity of gods was in the heavens from humans’ formative conception. When that idea resurfaced during Rome’s transition from pagan empire to a Christian presence in the following millennium, it demonstrated the persistence of cultural ideas (memes) that survive via the medium of human memory and belief. In the interim, the Greeks in the person of Plato and other thinkers subsequently supplied the philosophical rationale of the world soul, which spread through the colossus of religious belief via Aristotle, Abraham, Paul of Tarsus, the Neoplatonists, unto Constantine, the Prophet Mohammad and, in the thirteenth-century, Thomas Aquinas, among many others, thus staunchly assuring the personification of a prime mover and ruler of the one-turning universe. Now in the Space Age, with photographs of stellar and planetary creation from the ashes of supernovas being readily available, that earlier meme has now outrun its currency. The idea of binding-back to the harmony of the formerly convenient fiction of cosmic unity is now over-stretched as a footnote to the meandering history of situated intelligence at the core of the human mind. This long-standing abuse of the stars was upheld by all monotheistic religions, even after Nicolaus Copernicus (1473-1543) made it clear that our planet is not now and never has been the center of the solar system. This revelation (long known by some) scuttled the idea of the universe and world soul as conceived up until then. As a truth claim, that former vision was proved to be false. Long before then the meme of a divine prime mover at the center of the cosmos had become a cultural fixture. And that fixture was deeply embedded in the foundation of the three major monotheistic religions. Not only that, but in the institution of religion itself. The tenacity of that meme in surviving against all odds hardened it from an ideal belief into a rigid universal constant unscathed by the mass of undeniable evidence that it was untrue. It was a truth of faith, not fact. That faith had expanded from a regional Sumerian revelation in the Land between the Rivers, to a prescriptive belief that built monuments in other lands, to a global faith destined to implode from the weight of its inconsistencies as yet one more chapter in the history of intelligent minds in black boxes attempting to solve the world puzzle. I take this chain of events as demonstrating the persistence of ideas that, once entertained in a given mind, become generally accepted by expanding numbers of people to, like a ripple made by a pebble thrown into the ocean, eventually engulfing the Earth. Never underestimate the power of an idea in a single mind to which subsequent generations are born, all doubt having evaporated in the meantime, so the new generation takes guidance from the ritualized wisdom of the ancients. Think of spacetime as subject to gravitational influence. Turning trees into toilet paper. Eating with chopsticks. Eating with silver. The World Wide Web. Driverless cars. The birth of Venus. Pinocchio. The Tooth Fairy. Evil. The infallibility of the Pope. Justice. Truth. Peace. Freedom. Eternal love. Cultures are built from two-way engagements between human minds. Individuals get what they want; groups of people get what they need to sustain their belief in the mystery, majesty, and convenience of an idea that floated to the surface of a mind and spread far and wide in general practice as if by law. Projected onto the stars, the meaning that some of our distant ancestors found in their orderly procession was that they were compelled as one body by a prime mover, alleged source of, and driving force behind, the rational, harmonious order of the universe. The notion of a prime mover was wholly a fiction in human minds, a product of deluded imaginations in not being able to detect their own planet’s motions because as a people they moved with the Earth and had no reference other than the stars to gauge that impression by. So if the stars seemed to move, that was enough to convince them that that must be the true state of affairs. Many believed it, and said so. Opening the door to a myriad of profound consequences, which still persist among us today. Wars have been fought, millions killed, heretics burned at the stake as a result of such beliefs, or, rather, the denial of such beliefs. Those deadly consequences, as residing in human minds as matters of orthodox faith and belief, are what I am concerned with in these several posts dealing with our human engagements with the stars as I develop the big picture based on my reading and experience. Along with the concept of one turning in reference to the nightly round of the stars, several other concepts accompany that of the prime mover; the idea of harmony as the essentially rational and defining characteristic of the stars moving in unison to constitute a cosmos in contrast with a disordered chaos; and the idea that deviation from harmony was a message played like notes against a musical scale intended to call people on Earth back into harmony with the circling stars. The five visible, star-like planets (Mercury, Venus, Mars, Jupiter, Saturn), as well as sun and moon, did not share in the disciplined rotation of the stars, but travelled their own ways among them along a broad pathway of their own in the middle reaches of the stars overhead. That pathway was not random but stuck to a middle way along a particular band of stars that ancient peoples visualized as forming twelve houses or constellations, the band coming to be known as the ecliptic, the celestial path among the stars along which the messenger planets (Greek angelos, messenger) traveled and, when those paths coincided, conjunctions and eclipses might occur. The twelve, thirty-degree zodiacal houses (constellations) along the ecliptic were deified as domains ruled in monthly succession by twelve godlike figures, together forming the ring of zodiacal signs marking the progress of the seven angelic messengers. 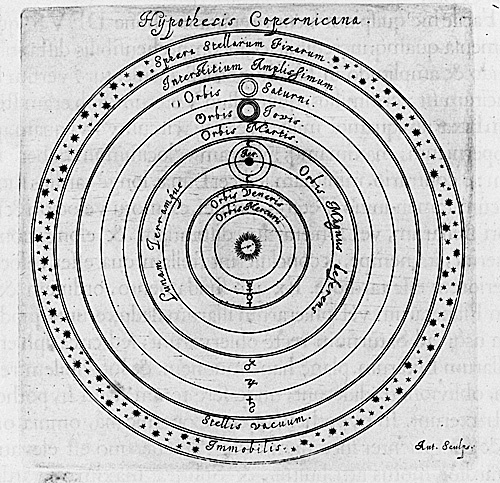 No one realized that that background of stellar houses was far behind the moving planets, so had nothing at all to do with them because it seemed to observers on earth that the stars and planets were equidistant, so that the luminous messengers traveled among and briefly resided in stellar houses that existed solely in human imagination. Once the stars became animated by ancient humans projecting their quest for order onto the cycling radiance overhead, the stage was set for conception and projection of prime movers, creators, supreme beings, and rulers of the (supposedly) one-turning universe. The stars and the messengers weaving among them bore whatever meanings arose in those who projected their minds in beseeching the cosmos for guidance in conducting their Earthly lives and affairs. Temples and sanctuaries such as those structures at Göbekli Tepe, Stonehenge, and in Sumer at the head of the Persian Gulf were in many instances built as stellar observatories to mediate the traffic of signs between heaven and Earth, local authorities assuming the office of translator of heavenly messages so their followers would receive the proper message and behave accordingly. So did religion become a fact of life on Earth in binding human labors to the will of the gods above, or most particularly to the will of the prime mover who set the cosmos in orderly motion for the purpose of inviting humans, if they knew what side their bread was buttered on, to partake in the rational order exemplified by the stars overhead. Sumerian minds, looking up from their marshy homeland in the delta of the combined waters of the Tigris and Euphrates Rivers, became famous for conceiving of such deities (shining or radiant ones, later depicted with haloes) some five- or six-thousand years ago. Among other gifts to their descendants, the Sumerians are now famous for leaving behind them a great trove of statuettes of worshippers with folded hands and dilated, dark-adapted eyes, only much later to be discovered by archaeologists within the past 150 years. The figures depict worshippers in the grips of a variety of fraught human situations beneath the stars at night, looking to be told by the messenger stars what to do because that was their duty, to heed the will of Sumerian gods. What the Sumerians invented—along with cuneiform writing on clay tablets; an extensive literature of poetry, myths, lamentations, hymns, and wise sayings; and religion built around a priestly profession as we know it today—was an intricate system of awe so lustrous as to have a compelling effect in organizing the behavior of a people who sought answers to their most pressing problems from the seemingly informative movements of the planets weaving among the orderly motions of stars along the ecliptic. The Sumerians placed not one but three gods in the heavens, one for each of the three regions: celestial polar region, residence of the creator and prime mover, Anu: zodiac against which the seven messengers moved, ruled by Enlil, king of the gods; and outer fringe thought to be closest to Earth on the outskirts of the cosmic dome, home of Enki, source of divine wisdom. It was a great scheme by which the Sumerians mapped out the heavens some 5,400 years ago, a scheme still with us today in the doctrine and structures of the church. The essential teaching of that scheme was “On Earth as in Heaven,” a notion backed up by the seasonal return of the sun to the same house along the ecliptic, signing the start of a new year and another round of the liturgical calendar. Genius; pure genius. Because it was true: human affairs on Earth do run according to a calendar dictated by the seasons, and the seasons by the stars. The hitch is that it wasn’t that the stars were moving according to the prime mover’s plan, so seeming to dictate to people what they should be doing with their limited bodily energies; those stellar motions were really due to Earth’s daily rotation about its axis and simultaneous orbit around the sun. There was no prime mover at the celestial pole. There was no godly king of kings managing the motions of planets along the ecliptic. There was no divine wisdom filtering down from the stars for human guidance. We already had the seasons to alert us to our proper annual labors; the stars were incidental to what we already knew. They were an offshoot, not the source of our wisdom. The stars told us nothing we didn’t already know. It was the Sumerian priesthood that maintained that the heavens were the center of Sumerian life on Earth, and that the people needed their lofty interpretation of signs and directives—otherwise they’d be out of a job. Priesthoods offer the best job security on Earth if they can convince flocks to behave as they already know they should. There is a font of circular reasoning at the heart of every religion. And we have such a plethora of religions precisely because each one has to develop a convincing rationale for the people to support the local priesthood in its annual rounds of reasoning. These comments are what I was talking about in developing the big picture of our human engagements with the stars. For much of my life I have read Joseph Campbell, Samuel Noah Kramer, E.O. James, and James Frazer, and others of similar bent in bringing ancient ideas to life. For me this has been recreational reading to accompany my fascination with fossils and the expanding literature of evolutionary biology. Looking both to the past and the future, I was doing my best to keep pace with the world I lived in, which was expanding at an ever increasing rate. My bookshelves today are lined with such books, testament to the interests that have sustained me throughout adult life. Now that my life is winding down, the residuum of my reading takes on a greater importance because I see so much harking back to a more comfortable (because familiar) world rather than a willingness to enter the next stage of human development and understanding. If I do not contribute to that understanding, why have I lived through the past exciting years? So here I sit at my computer keyboard in Bar Harbor, Maine, blogging about what matters to me at my time of life, adding my thoughts and observations to the great flow of human engagement with our Earthly surroundings. Should I live so long, you can expect that I’ll have more to say about our stellar engagements tomorrow.